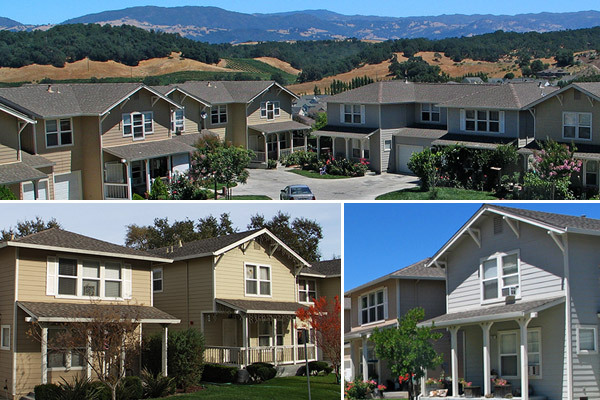 The Quarry Ridge subdivision consists of 20 affordable duet homes with single-car garages on a 1.93 acre site adjacent to an existing single family subdivision in Healdsburg. This Burbank Housing Development Corporation neighborhood is a self-help sweat equity project in which the homeowners construct a substantial portion of their homes. Nestled into a sloping hillside with oak trees and spectacular wine country views, this project created an affordable community within an upscale neighborhood. Starting with easily constructed rectangular prototype plans, the addition of porches, posts, gable brackets, shutters and a variety of window combinations creates architectural diversity and individuality without unduly increasing construction costs. The 3 and 4 bedroom homes are 1290 and 1400 square feet in size, respectively, not including the garage.